Sunday, 4th of August, 1985 the Soviet Union attacks. The attack came quickly after news of the Soviet advance reached you. Your men have been preparing for this battle, but the reality of it actually happening is still hard to comprehend. But they’ve really started it -World War III. Your orders are to hold the ridge, no matter what, and that’s what you plan to do. Scanning the battlefield you see your ITVs open fire on the advancing Soviet tanks as they pour out of the distant treeline and into the valley. Now is the time to act. They may have started this war, but you’re going to end it! Your platoon is fully customisable, you get to choose what nation you want to play, you get to pick what models you want to run in your platoon, what upgrades your platoon needs, and which heroes you will enlist to help you win the day. What is your play style? Will you go with a tank swarm with no upgrades or heroes just to get the superior numbers? Or do you want to fully load one of your nation’s best tanks with the best crew and upgrades you can find and use one super tank to take on your foes? In TANKS: The Modern Age you can do whatever you want, and with our dynamic pointing system you and your opponent can easily build lists and have fun balanced games against each other. 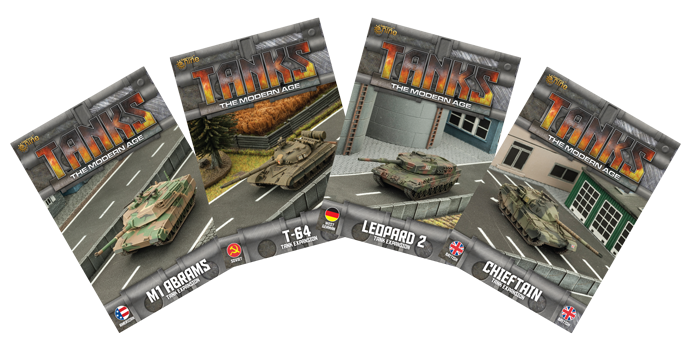 TANKS games are easy-to-learn, quick-play and small-scale so you can play almost anywhere. Just grab a good friend and the TANKS Starter Set and you have everything you need to get started. Turns are simple, you move your Models, you shoot, and then you complete a command step, meaning you will spend less time in the rule book and more time playing the game.